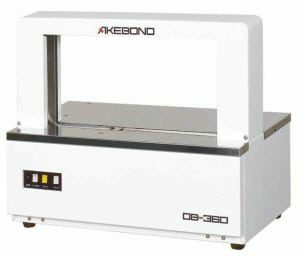 This is a high speed (~30 cycles/per minute) paper/tape banding machine from Akebono. It supplies banding to packages as small as 30x10mm, or up to 480x210mm. It accepts and uses paper or film tape, and the new track design allows the use of 60-100μm film, reducing cost and waste. Adjustable Tension – Push Button or Foot Pedal operation. Pause Mode eliminates any potential tearing of tape. Impeccable Sealing Technology Sealing Design eliminates curling, folding or peeling of tape edges. The optional stand for the OB360 enables the use of much larger reels of paper tape or Film which reduces the amount of reel changes needed when banding large product runs, and also raises the height to a more easy to use level. Paper and Film Banding Machines for use int he packaging industry, and in commercial and trade applications.